63 ¼ x 75 ¼ in. This painting combines aspects from two works by Wudl: Undefiled Tranquil Light (2015) and The Known Universe #2 (2012). If we look at these works comparatively, Radiance of Sublime Reality Filling the Cosmos without End can be seen as a magnified view of what might exist within the flower and the space it occupies. 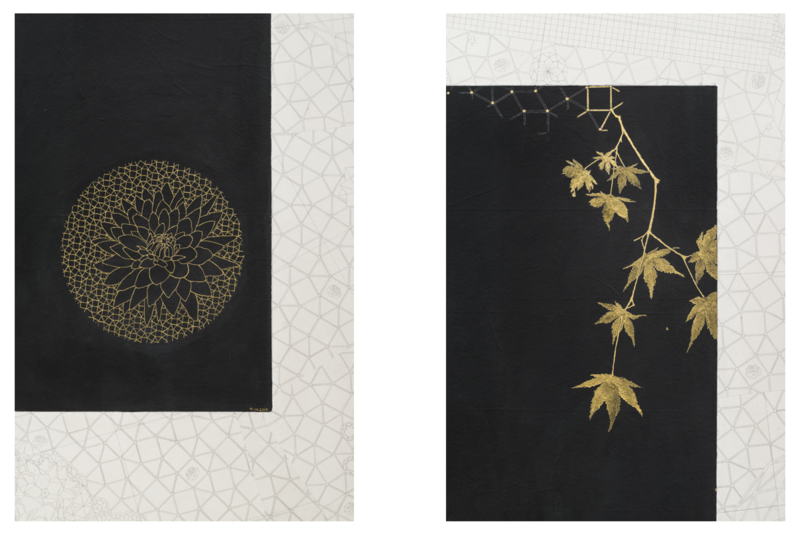 Surrounding the composition are drawings on handmade rice paper collaged at various angles. Unifying these drawings is an underlying geometric pattern inspired by, although not representative of, scientific molecular diagrams, and signifies the subatomic structures that comprise all matter in the universe. 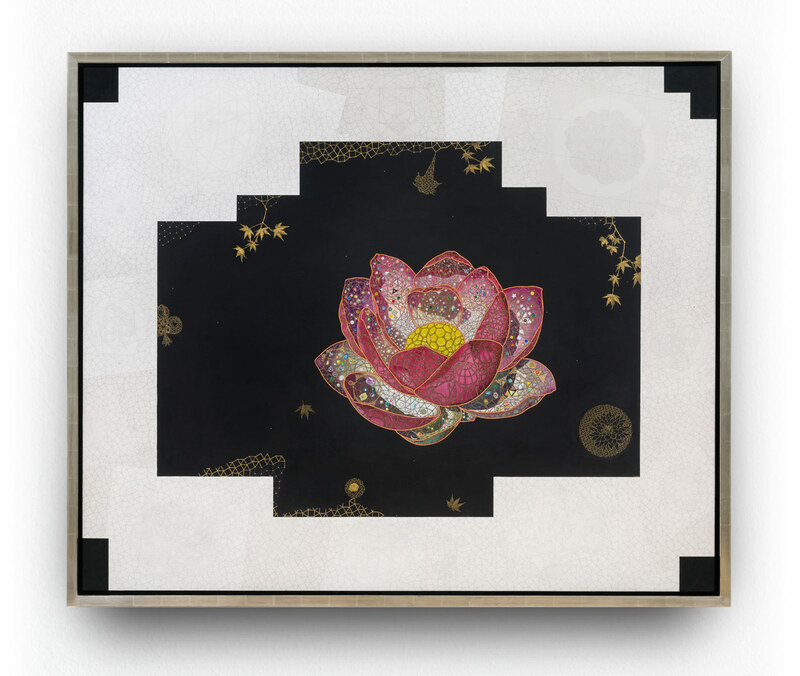 As the pattern extends beyond the collaged frame, it begins to alter and dissolve into vast emptiness – representing a transition from the visible world into that which is inconceivable. Maple leaves, rendered in gold and to actual scale, ease this transition and serve to ground the viewer in our physical world. At the center is a lotus blossom suspended in space. Within each meticulously rendered petal is an immersion of geodesic gem structures in which shimmering jewels (also scaled to life-like proportions) are interspersed. 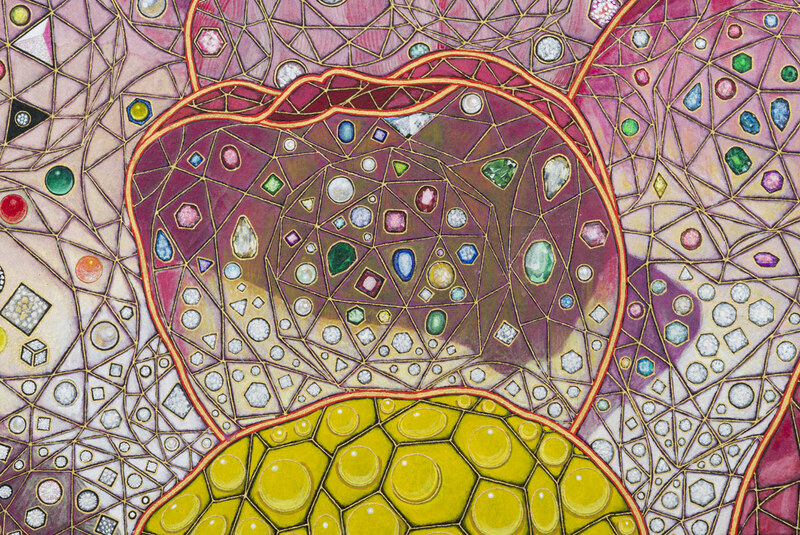 The dense dispersion of gems and jewels push the viewer to peer beyond the flower’s surface and into the unfolding possibilities of infinite realms within the floral form. In relation to the Avatamasaka Sutra, we can view the radiantly sumptuous flower as the awakened mind transcending the limitations of our own perceptions. 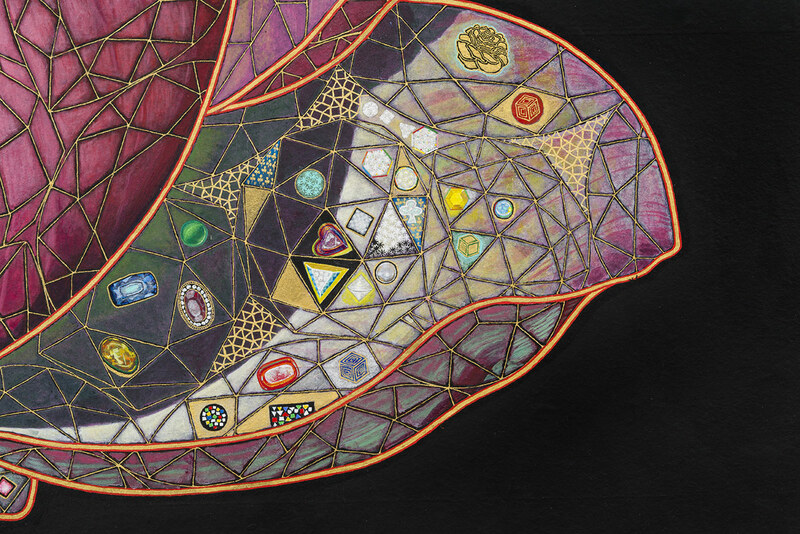 Jewels, symbols for enlightening teachings, abound in a variety of shapes and forms; their reflective surfaces allude to the interconnectivity and interdependence of all things. This painting is a summation of all the works in this exhibition. Various elements, suggested in other drawings and paintings, come together in full scope, displaying the depth of Wudl’s visual language. Measuring 5 x 6 ft., this is the largest work Wudl has created on this subject to date. To gain a better understanding of the source imagery in Wudl’s paintings, here is a video of the artist reading from the first chapter of the Avatmsaka Sutra.